Are you thinking of investing in your own logo plate? Why not choose ShieldCo to be your partner? We cater to various designs on different dimensions that are perfect for your brand. Feel free to send us your preferred designs and desired sizes. Don’t have a design yet? Worry no more! Our team of skilled designers can accommodate and help you to create your own unique and stunning designs for your business. All ShieldCo custom metal signage is made with custom designed and laser-cut metal. Our customized copper signs are one of the most sought after. Due to its vibrant orange color, this metal conveys a warm and energetic vibe very suitable for, but not limited to, interior designs, salons, and fashion businesses. The copper sign below is one of our finest work for the “Clagett Center”. We use the latest techniques in laser-cutting to get the finest results while maintaining the sophisticated details of each design. 60” wide design - five layers, a representation of Downtown Frederick Maryland. More cityscapes are available! Below is a list of metal you can choose from. We commonly work with aluminum however, we can work customize everything for you to get the best choice for your business signs. We produce admirable custom-designed metal signs that are used by certain Personalized Businesses or Family name signs. Here’s a ball peen hammered copper made by our team specifically for Concrete General. Hand hammered copper backer, laser cut powder coated parts layered onto the sign for 3D effect. The Concrete General signage. We put a ball peen hammered copper as a backer on its metal sign. And for the logo’s design, we made it like it is floating. Thus, making the open way sign to look more stylish. Furthermore, to exceed the expectations of the customers, we made this type of design for it is very applicable for the construction businesses since Hammered copper has an earthy, organic, natural, kind of vibe. We use lasers that cut at a width of 0.001 inches, allowing us to create designs with incredible detail. The colors of our finished products are also beautiful as we powder coat, which is the best way to paint metal. And what really distinguishes our metal signs is that we can lay all parts of our signs together to create three-dimensional images from simple signs, from two layers to twenty or more layers. Below are some examples of different usage of copper sheets from well-known companies. Cartier. Another company logo with a halo-lit backer sign and cursive letter copper mold. Making the metal sign easier to notice and persuasive to look at. These kind of designs are more common in companies that sell luxury goods due to its elegance and luxurious look. Wedding Sign Bridal Decor. Rustic wedding themes are on trend today. Hence, copper plated signages for wedding decors is ideal for accomplishing the rustic shabby chic feels for elegant vintage wedding decor. 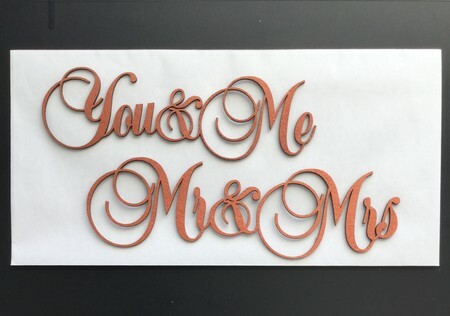 The highly cursive laser cut words with the hue of a copper gives the rustic yet luxurious feels for the happy newlyweds. Address Numbers. 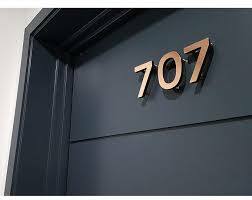 Houses, cafe, room numbers or any signages that are made of copper makes a property looks more decorous, due to its homey ambiance. That’s why most property owners most prefer copper-made signages. However, keep in mind that this design can be suitable for your property depending on its architectural design. It is better to ask for assistance to your designer to make your place look good, and the aesthetics come into place. great light fixtures and many more. Many of these signages can be found in churches, law firms, hotel room doors, house address, family names, etc. These copper signs are suitable for both interior and exterior designs which made this type of metal adaptable to any designs. There are numerous ways to make a sign, but a metal sign will be the most durable and highest quality option.